in the magical Kingdom of Learn Hebrew Pod, lived the fair maiden Liat and the handsome prince Eran. But Liat and Eran were more than just fair and handsome, they were also extremely talented . . . the most well-known and admired actors in all the kingdom. Indeed, on the day before our story begins, they had been summoned to perform for the royal court in a special production of Puss ‘n Boots. Also in the Kingdom of Learn Hebrew Pod lived the Wizard Jonathan, known throughout the kingdom as the wisest and most mysterious wizard of all time. Not only did Jonathan exceed all the other wizards in his knowledge of teaching Hebrew, but he also seemed to know a little bit about everything. He knew, for example, that the Brothers Grimm hadn’t exactly written Puss ‘n Boots, but that they had been the ones to collect the story orally and record it in written form. Jakob and Wilhelm Grimm began collecting their stories just after the turn of the 19th Century by inviting storytellers to recount their tales and then transcribing what they had heard. (Interesting . . . there are many Hebrew texts that were written in just the same way. Oral stories and traditions were passed down from generation to generation. Finally, someone decided to record them to make sure that they didn't get lost.) By the time the first edition of Brothers Grimm’s collected stories was published in 1812 and 1815, it included over 150 fairy tales. (That’s sure a lot of “Once Upon a Time”s!) It is very likely because of Jakob and Wilhelm Grimm that we know some of our favorite fairy tales today: Snow White, Cinderella, Little Red Riding Hood . . . the list goes on and on. And speaking of the study of language, it seems that we have come right back around to the Hebrew-teaching Wizard Jonathan, the fair maiden Liat, and the handsome Prince Eran . . . and what they will be adding to our study of language in Learn Hebrew Pod shiur mispar araba-im ve-achat. First, we will learn--in Hebrew and in English--even more about Brothers Grimm. Then we will get to meet our fifth Hebrew building block for conjugating verbs--building block Pu-al. 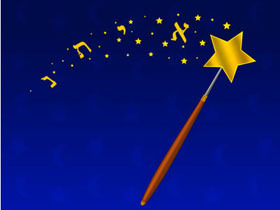 And though conjugating verbs may not be quite as easy as waving a magic wand, Eran, Liat, and Jonathan are certain to bring you under their spell.